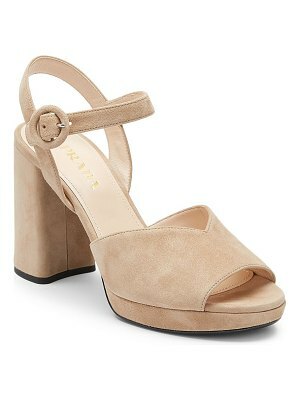 Rebecca Minkoff sandal in suede. 4. 3" heel; 0. 5" platform; 3. 8" equiv. Peep toe. Square-cut strap. Adjustable ankle-wrap strap. Covered heel with keyhole. Cushioned insole. Leather outsole. "Ivy" is imported.